Finding your way to the roof of Africa is on many adventurer's bucket list. Our Kili packages offer training and preperation in order to maximize your chance of successfully summitting the highest mountain in Africa. We use high quality partners on the ground in Tanzania to ensure than everyones experience is as safe and comfortable as possible. The 7 day Rongai Route is an itinerary which allows camping each night (rather than hut stays), keeps off of the trails with the most people on them and, follows a loop so, there is no repeating the same trail. Many operators offer this as 6 days but, we recommend doing this in 7, allowing an extra day for acclimitzation and, raising the chance for success. Vehicles take climbers to the gate at 2,000 metres at the entrance to the forest on the north eastern side of the mountain. This is a journey of a little over an hour from Marangu. From here it is a 3 to 4 hour walk, gradually ascending through the forest, to the camp which is just clear of the forest at 2,600 metres. The path ascends on a good path through Alpine moorland, similar to what is found on the Marangu route, to Second Cave at 3500 metres. After a lunch stop here, the path forks left towards Mawenzi. After another 3 hours on a rocky path, Kikelewa Cave is reached at 3690 metres. Total time is about 6-7 hours. This is really quite a long day, although most of the altitude gain is achieved in the first half of the day. The path climbs up a steep ridge directly towards Mawenzi. At the top of the ridge, the path turns left and traverses across rocky landscape and then descends into the Tarn Valley where camp is made at 4320 metres. The distance covered is only about 5 kilometres but this usually takes about 3 to 4 hours because of the steepness and altitude. 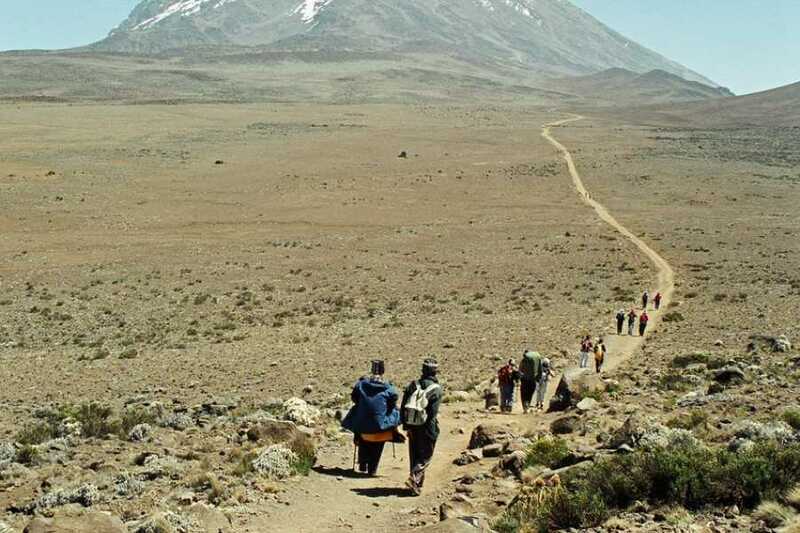 After lunch at Mawenzi Tarn, climbers can trek up into the north corrie of Mawenzi to admire the mountain and to get views eastwards down the Small Barranco (the second largest valley on Kilimanjaro) or westwards across the Saddle towards Kibo. Climbers retrace their path of the previous day for a short distance, and then descend to the Saddle between Mawenzi and Kibo. 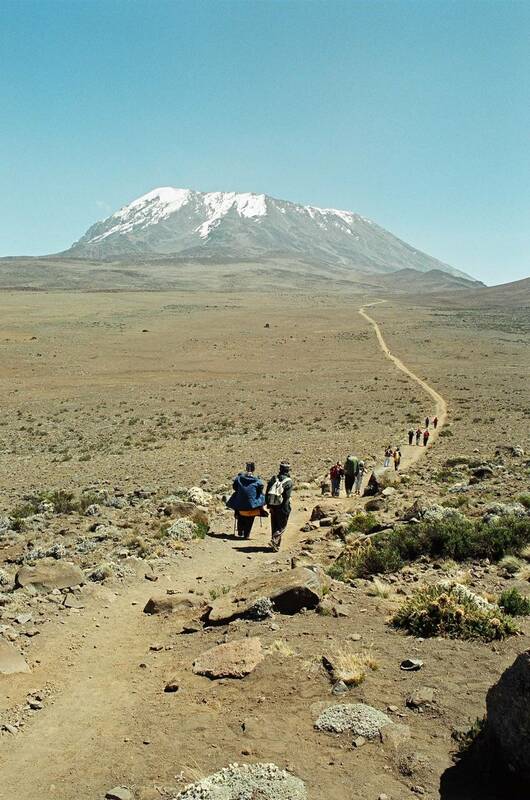 There follows a 6 kilometre walk across the gradually ascending high altitude desert to Kibo Hut. Camp is made close to the hut at 4700 metres. Total time is about 5 to 6 hours. Climbers are woken at about 11pm. After dressing in all their warm clothing, they have a hot drink and then set off at midnight. The first part of the ascent to the Hans Meyer cave is quite indirect, going around large rock outcrops and it is not as steep as the latter part. The surface is loose and can be hard going. After the cave the scree slope becomes extremely steep and you have to climb in a zig-zag fashion. It takes an average of 6 hours to reach Gillman's Point on the crater rim. On a fine morning, the views of the sun rising from behind Mawenzi are spectacular. Gillman's Point is at 5,700 metres. From here, the path goes around the crater rim for a further one and a half to two hours to the summit at Uhuru Peak, 5896 metres. The descent back to Kibo Hut can take a further 3 or 4 hours. After a rest and a meal, the descent continues to Horombo Hut via the lower route, a further trek of around 3 hours. The descent from Horombo to Mandara Hut takes around 3 hours, and the final part of the descent through the forest to Marangu Gate takes another 2 hours. At the Gate vehicles will be waiting to take you and your crew back to the hotel.